Bill Carter reacts to President Trump's complaint that "SNL" is unfunny and unfair. Trump asked, "How do the networks get away with these total Republican hit jobs without retribution?" 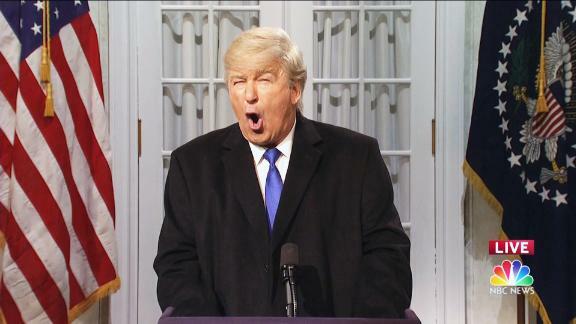 Carter says Trump must have watched Alec Baldwin's impression of him on Saturday night. On Friday, President Donald Trump declared a national emergency because, as he put it, there's a "national security crisis on our border" marked by "an invasion of our country with drugs, with human traffickers, with all types of criminals and gangs." With that type of calamity bearing down on our nation, you would expect Trump to be laser focused on the threat in the days that followed. But this weekend, Trump managed to find time to watch NBC's "Saturday Night Live," which he notably hosted twice in the past, and then took to Twitter to not just slam the show, but to suggest there needs to be "retribution" and that the comedy show should be investigated. It was the latest escalation in his war on free speech. He first tweeted Sunday morning, "Nothing funny about tired Saturday Night Live on Fake News NBC! Question is, how do the Networks get away with these total Republican hit jobs without retribution? Likewise for many other shows? Very unfair and should be looked into. This is the real Collusion!" Then four minutes later, he tweeted in all caps -- telling us how he apparently now views the iconic comedy show as part of those threatening our nation: "THE RIGGED AND CORRUPT MEDIA IS THE ENEMY OF THE PEOPLE!" Could Trump be laying the ground work to declare another national emergency to silence SNL?! Aside from the absurdity of the idea, it also violates the First Amendment right to free speech, as the American Civil Liberties Union was quick to point out. And, second, this wouldn't be the first time a GOP president used his powers to silence comedic criticism. In 1969, the liberal-leaning CBS comedy show "The Smothers Brothers Comedy Hour" mocked then-President Richard Nixon to the point where the comedic duo made it onto Nixon's "enemies list." Nixon then used his well-placed allies in the ranks of CBS executives, including CBS programming chief Robert D. Wood, to get the show canceled. So, what was it about SNL on Saturday that so upset Trump? Perhaps it was the show's cold open mocking Trump's emergency declaration. Alec Baldwin, playing Trump, said "I'm here to declare a very urgent, important national emergency. This is a big one so I don't want to waste any time. That's why first I want to blow my own horn a little bit, OK?" This mirrored what we saw during Friday's press conference when Trump opened the media event by first bragging about what a great job he has done on trade, the economy, etc., before getting to the alleged emergency. And then there was this line by Baldwin that may have unnerved the thin-skinned Trump, because it so closely mirrored his own life: "In conclusion, this is a total emergency, a five-alarm blaze, which means I have to go to Mar-a-Lago and play some golf." Trump is at Mar-A-Lago this weekend. My hope is that members of the media who interview Republican members of Congress in the next few days ask them point blank whether they would support Trump's "retribution" and potential investigations into how SNL and other comedy shows create their shows. It is important Republicans make it explicitly clear that Trump's war on freedom of expression is wrong. But I bet many Republicans will skirt the issue -- responding with "no comment" or playing to their base by saying Hollywood has long been biased against the right. In either case, they will be emboldening Trump's attacks on the media at large. I worked on the production team at "SNL" for eight seasons, at a time when the show comically filleted Bill Clinton and George W. Bush. But never did either of them publicly complain the comedy was unfair. They understood that political comedy is part of the fabric of this nation -- even when they were the target of the jokes. If Trump does nothing more than take to Twitter to slam "SNL" for its jokes about him, these attacks must still be called out. Why? Because they are more than just wrong -- they are un-American.